Since a few months back I work at the Östergötland County Administrative Board as an archaeologist. A project that has been ongoing for some while, that I haven’t worked on, is a video-project displaying some of the ancient monuments in Östergötland County. Information on the films are presented here. The first of at least four films was uploaded a few days ago via Youtube, it’s available in Swedish, English and Arabic and is about the Svaneholm castle ruin outside Mjölby built during the 14th century. Today I’ll attend a seminar on current research and projects concerning the Middle ages in Sweden åt Östergötland County museum, Linköping, Sweden. The seminars are being held by contract-archaeologist as well as resrearchers. Krokeks Cloister – the franciscan forest convent by Marie Ohlsen, Östergötland museum. Slaves, tradesfolk and common people – strangers during the middle ages and how we find them by Mats Roslund, archaeologist, Lund University. To work with a gender perspective on historic landscapes by Elisabeth Gräslund berg, geographer, Stockholm University. Musical meetings – music during the Middle Ages by Lars Jonsson, music producer and artistic director, NoMeMus. This post will be updated during the day. The game of thrones – the real world? I’ve just read Jan Rüdiger’s Did Charlamange know Carolingian kingship theory? Before I start off on the book a few notes on who Charlemagne was and on Carolingian theory. In short; Charlemagne (ca 740-814 AD), my namesake, Carolus Magnus aka Karolus Magnus, meaning Charles the Great was the king of the Franks from 768 and Emperor of the Romans (Imperator Romanorum) from 800 to his death in 814. He expanded the Frankish kingdom, a a Germanic tribal confederation first attested in the third century AD then living north and east of the Lower Rhine River, to include a large part of Western and Central Europe. He is also associated with the Carolingian Renaissance, a revival of art, religion, and culture through the medium of the Catholic Church and via this has come to defineWestern Europe and the European Middle Ages. Politically the Carolingians succeeded the Merovingian as rulers of the Franks. Under the Carolingians, the Frankish kingdom came to include most of what today is calledWestern Europe. The phrase Carolingian kingship theory didn’t really say all that to me so before reading the book I tried to get a scenes of the meaning behind the phrase. The Carolingian dynasty was as stated above a Frankish noble family. The name Carolingian derives from the Latinized name of Charles Martel: Carolus. The family consolidated its power in the late 7th century and became the real powers behind Merovingians. By 751 AD, the first Carolingian king was crowned; Pepin the Short. The traditional historiography view on the Carolingian assumption of kingship has been that it derived as the product of a long rise to power. The phrase Carolingian kingship theory reflects the view on how the Carolingian came to claim the throne a.k.a. the game of thrones – a power struggle between king, the noble families and the church – a long term plan or the aspirations of one or a few men. Or at least that was what the title lead me to believe – instead its a work on political language and the gap between the written word (latin) and the spoken word. A barrier to separate, exclude and include. – a way of using the language to your advantage. During the middle ages a lot of the languages that are around today where forming, in that transformation what position had Latin? In written sources it’s the main language at least up until the 13th century – though still important the national languages becomes more an more so. From this written sources can we find the the oral or political language of the time, how was it used and by whom – what did the development of new languages mean and to what degree did that change the political landscape? What can we find of this in the medieval texts? Jan Rüdiger does not provide all the answers – though he suggests a few, but gives some keys to seek answers concerning this and some questions to get us started. In many ways this describes a time with parallel languages, e.g. we can guess that most spoke the national language, some Latin, most knew about Latin but didn’t need to know it – in political language there’s also conventions, your supposed to speak in a certain way, in a certain language etc. This world really isn’t that different from today; we all speak our national language but many of us can’t survive without knowing at least one more – at least if we want certain things; today it might be English but there is also new languages and codes being born through the use of internet, smart phones etc, some languages are more ones and zeroes other coded in form of smilies, new shorts such as LOL etc. New conventions, new languages in a world that seems to be on the verge of turning upside down by economic crises, political chaos, new technology and “new“ dynasties ready to take over the world whilst the old ones are crumbling – not all that unlike the time of Charlemange is it? So this might still be a book that hold keyes to the game of thrones – the real world. 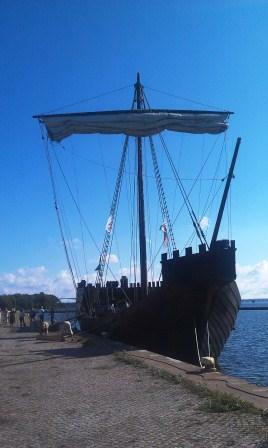 Yesterday a replica of an medieval cog anchored just outside Kalmar County Museum. The cog is a replica from a cog built ca 1390 AD or a little later. Its built by Fotevikens Museum and the city of Malmoe. 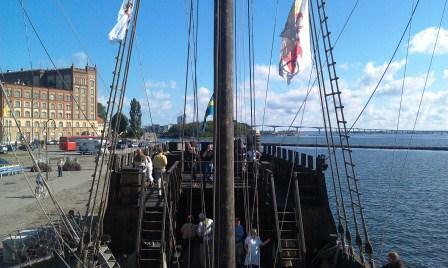 A cog or cog-built vessel is a type of ship, the earlist one known is from 10th century. It was widely used from around the 12th century on and are mostly associated with medieval Europe, especially the Hanseatic League, particularly in the Baltic Sea region. Cogs, such as this, were generally built of oak. 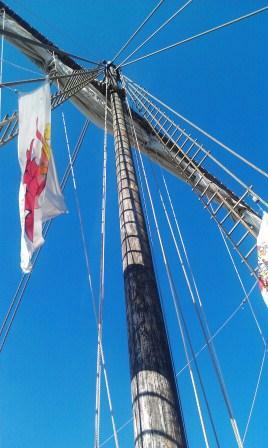 The ship was fitted with a single mast and a square-rigged single sail. This one is large and based on a wreck found outside Scania, they are currently on their way to Gotland. Read more about the cog at Fotevikens webpage. I promised to get back to you with some further information on the Karlevi rune stone. 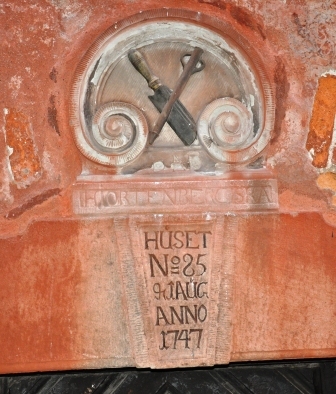 It is placed on the island Öland in Vickleby parish and has the signum Öl 1. The inscription is dated to ca 1000 AD. 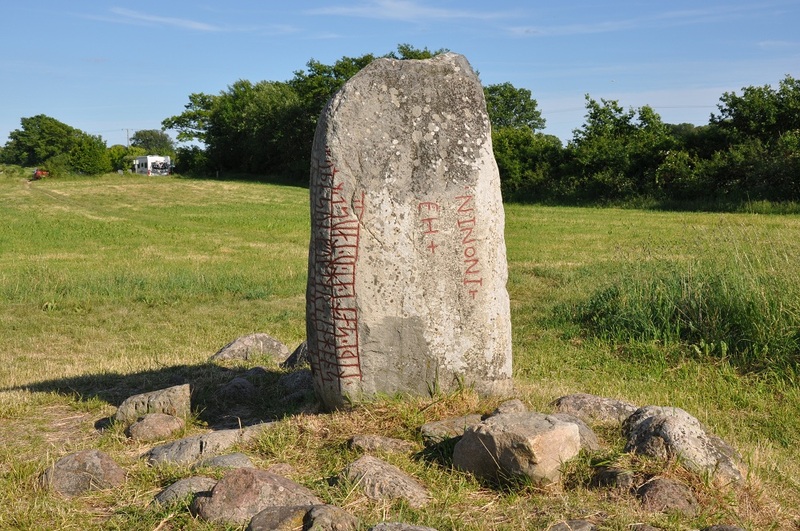 Part of the inscription on the Karlevi rune stone is written in dróttkætt, an Iron Age metre. 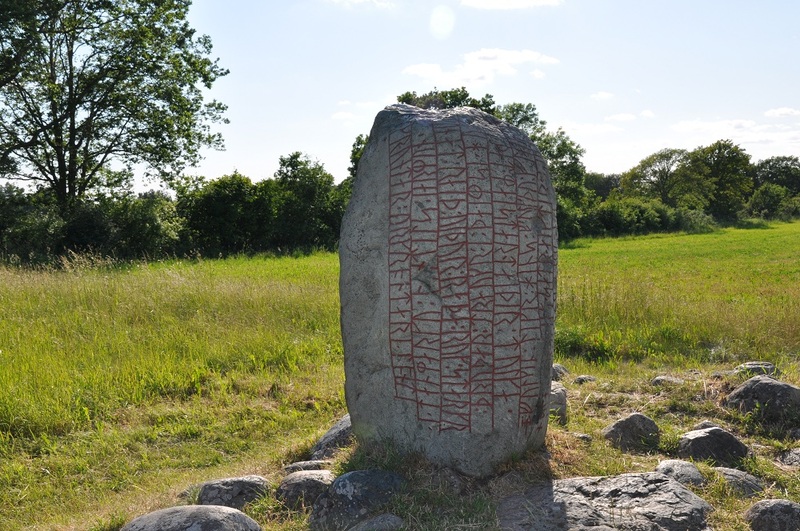 It is the only rune stone with a complete dróttkætt on it. The name in itself is interesting; drótt is a collective word that can be translated into; a chieftain or someone who had sworn retainers. In other words dróttkætt could be translated into a verse or metre suitable for a chieftain or court of sort. It includes two kenningar, a kenning is a euphemism for something, often euphemistically. The stone was erected for the chieftain Sibbe, Foldar’s son, on the stone he is called dólga Þrúdar draugur; the last word draugur is a well known kenning for ‘warrior, doer, performer of battles’, dólg means ‘hostility, strife, battle’ and Þrúdar is the name of one of Thor’s daughters, a goddess in norse mythology. According to Sven B.F. Jansson2 the translation should be something like; executor, performer of the goddess in battle or warrior, warlord. Another interesting passage in the runic text is the word another kenning, devided into two strophes: reið-Viðurr + Endils iǫrmungrund. Endill is the name of a Sea-king, iǫrmungrund ‘mighty ground’, reið means ‘a wagon (chariot)’ and Viðurr is another name for the god Odin. 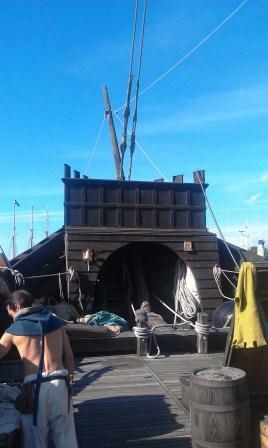 This could be interpreted as; The God of ships (wagons of the sea) is the Sea-King (or warrior), according to Klaus Düwel3 – in this case Sibbe might be seen as the Sea King or perhaps that he sails with the sea-King or is with Odin. The word iǫrmungrund is also interesting as it appears in Beowulf and Grimnismál as well which puts it in a larger geographical context than just Öland as do the mentioning of Denmark. The latin inscription is also interesting: IN NONIN- +HE… … It has been interpreted as In the name of Jesus(?) … … So the inscription is also part of a Christian context both regarding the letters and religion. Jansson, Sven B.F. 1997. Runes in Sweden. Düwel, Klaus 2001. Runenkunde, dritte Auflage.r, troligen naturligt. A few words on prehistoric and historic wine imports, etc. A few weeks ago I wrote about the discovery of a unique wine bottle, found on the sea bed of the Stockholm archipelago in the 1940s and was rediscovered in Vin- och Sprithistoriska museet (the Wine and Spirits Historical Museum) collections a couple weeks ago, read more here. Since then, I been reading up a little on Scandinavian wine imports in prehistoric and historic times, read about vindragarna (the wine pullers) and their guild here (in Swedish), and got hold of some information that I present below. This is but a few scattered notes. An interesting detail that the Groot Constantia bottle tells us is that wine was imported by the bottle. I have previously thought wine to be primarily imported in barrels or the like and then bottled in this country before sale. There are several examples of this, for example in the archaeological record from the neighbourhoods Apeln and Diplomaten in the city Jönköping – where archaeologist found several shards from bottles and bottle seals made in the Björkenäs glass works on Värmdö (1736-1786), outside of Stockholm. Björknäs glass works made bottles for wine and spirits among other things. The excavation was made by Jönköping County museum a few years ago. Via the Wine and Spirits Historical Museum in Stockholm I got an article by Karen Hjort describing the family Schulin’s wine cellar during the 1700s. The article is based on documents from Frederiksdal castle archives in Denmark. The oldest list is from 1744 and about 50 years older than the bottle found in the Stockholm archipelago. It runs through until 1808. Records show which wines you might expect to find in a bourgeois family in Scandinavia at this time, but also from which countries they imported wine. Johan Sigismund Schulin (1694-1750) had worked in the Executive Board of generalpostamtet (the Post) in Denmark, he was secretary of the German Kancelli etc and finished his career as a contemporary equivalent of foreign minister. In the first note 504 bottles are quoted: 9 ½ bottles of unfamiliar wine, three samples (a bit unsure of what is meant by sample but it’s not bottles) of Madeira, three samples of Mosel and Rhinsk wine, one Rhone wine, one Burgundy wine and ½ bottle of cherry wine, 83 bottles of English beer and 6 ½ bottle juice. In addition to this there are three oksehoveder (a measure) and 2 ahn and an one anchor rhinsk wine, translated this should be about 700 liters of red wine and 340 liters of Rhine wine. On the list is also mentioned usquebak which is synonymous with whiskey. Among the types of wine are notes of red wines, Pontac, Hermitage, Burgundier, Riinsk wine, French wine, Muscatvin, Samosvin, Mathers, Cote Roti, Constanze, Capvine, Hvid Capvin, Ungarsk wine, Syracuservin, Florentiervin, Peter Semeng etc. I found this translation table on the measurement oksehoved from 1647 for wine (obviously different dimensions for different products) = 1 ½ Amme = 6 anchor = 240 potter = about 232.5 litres. A quick glance at these facts shows that there are wines from several regions and countries – many of which still today are among the major regions. Wines from South Africa – the Constanza is there as well – that’s the winery that produced the wine in the bottle found outside of Stockholm. It is mentioned that there is both red and white Contstanz. The white sweet wine was the more famous. In the second half of the 1700s, the Constanz wine, and then the white sweet in particular, became hugely popular among the European aristocracy and was so until the 1880s when wine production in South Africa was hit by phylloxera. Later on in the documents one can find several other interesting comments such as wines from more other regions, such as Margaux and Médoc, and names of wine merchants, such as Toyon. In total 2799 bottles made its way through the cellar between 1744-1808. Let’s goback some years in time to the Swedish Middle Ages (1050-1523 AD). In Hans Hildebrands book Sverige Medletiden (Sweden the Middle Ages) it is stated the following on beer and wine; Beer plays the biggest role and can be called the national drink of the time, but wine is also mentioned. The first mention is regarding the funeral of Birger Persson in 1328 AD when three kinds of wine were served; white wine, Rhine wine and red wine from La Rochelle. During the 1500s there are references to wines from Klarethe (Claret, Clairet = Bordeaux), Malmarsey (possibly Italy and wines from grapes Malvasia), from Romani in Spain, Odersberg in Schleisen and from Thorn in Germany. The Wine imports in 1539 were nearly 50 000 litres – compared to Systembolaget’s (the Swedish Monopoloy) sales of wine in 2010 that amounted to 182 471 261 liters (Link in Swedish). In the encyclopedia Medeltidens ABC (the ABC of the Middle Ages), it is said that wine was imported by the aristocracy and the church, the majority of the wine came from Germany. From this book you can also get an idea of the price of wine at 14th century in Sweden. The wine from La Rochelle that were served at the funeral in 1328 costed 12 mark penningar per barrel (ca 150 litres), while the Rhine wine costed about 8 mark penningar per barrel. Compare this with the salary of a craftsman at the time which was about 45 mark penningar/year + food and drink or a farm labourer who earned about one mark penningar money for the summer and half a mark penningar during the winter months at the time. Wine was a luxury product and not for the common man. The wines are usually shipped in heavy wooden barrels, which made long-distance wine trade in principle only possible through waterways. The long journeys often made the delicate wine go bad. Because of this it was often seasoned with ginger, cloves and or nutmeg. Another popular combination was Klaret and Rhine wine seasoned with sugar, honey, cinnamon, ginger, cardamom and cloves. Then the wine was trickled from the spices, King Gustav Vasa’s (1496-1560 AD) court had it’s own brewer for this, Kilian Vintappare. Another type of spiced wine was Lutendank, a spiced wine mixed with milk (I’m pretty sure I don’t want to taste that!). There are written sources and archaeological materials that indicate that wine was imported to Scandinavia before the Middle ages. During the Viking Age one can guess that the Vikings came in contact with wine during their journeys to Greece, France and Spain etc, but also through the travels through today’s Russia to the Black Sea and back. When Sweden became Christian during the late Viking Age and the early Middle Ages the wine import became institutionalized as the Church needed wine for communion. The history of wine begins, however, long before this – the oldest traces have been dated to about 6000 BC. It is believed that the oldest wines were red and the white wines were added later. An early exampel of white wine is that found in amphoraes in Tutankhamen (death cirka1339 BC) tomb. As wine became a commodity it had to be transported and sealed. In antiquity they were transported in amphorae, which were sealed with pitch or resin. Sometimes they were provided with a layer of olive oil on top of the wine’s surface, as in the German example below. They also stirred down different spices and sulfur in order to extend the life of the wine. During the Roman Empire they began to store and transport the wine in barrels (wooden barrels) besides the traditional way of amphorae. That wine was transported in antiquity is obvious – there are plenty of amphorae around the Mediterranean as proof of that. 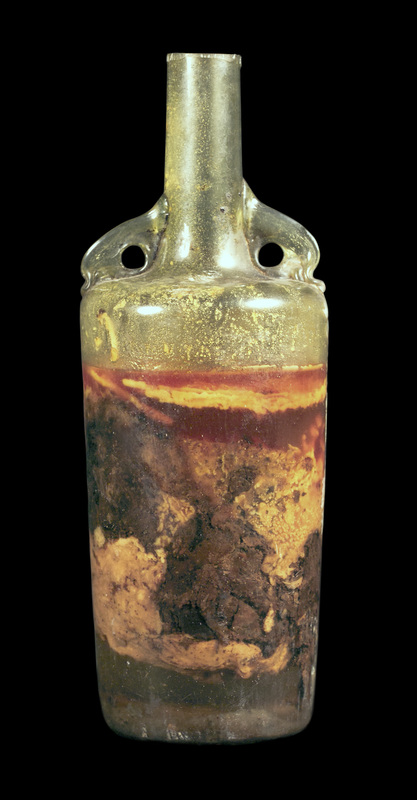 The oldest complete wine bottle with contents is in the Historical Museum of Palatinate in Germany. It is a ca 1600 years old Roman wine bottle with dolphin-shaped handles, dating to 325 AD. It was found in a Roman stone sarcophagus during excavations 1867. Amazingly, there were and still is some liquid remaining in it, two thirds is viscous and probably some kind of olive oil poured in for preservative reasons. They have also found traces of honey. Underneath this was residues of wine. The contents were analysed in 1916 by senior inspector Schmidt and Professor Halenke. The result showed that it most likely contained wine together with olive oil. Further analysis was done in1934 and 1937/1938 by Professor Grüß and Professor von Stockmann in Berlin. Their findings were never published and was lost, unfortunately, during World War II. The museum’s former director, Dr. Karl Schulz wrote in the 50’s that during the analysis they found scent of aromatic wine. The taste is unknown – no one has tasted the wine. There are currently no plans for new analysis. The wine bottle can be seen in the “Weinmuseum” as part of the permanent exhibition at the Historical Museum of the Palatinate in Speyer. The image is reproduced with the authorization of the museum. A big thanks goes to the Historisches Museum der Pfalz for information and accessrights to the image. Hildebrand, Hans (1983 nytryck). Sveriges Medeltid, del 2, Städerna.